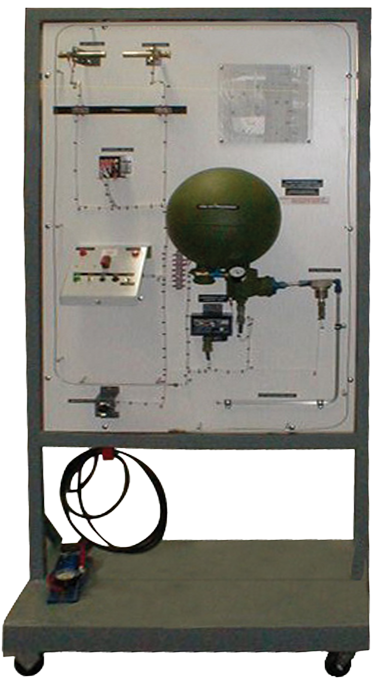 This fully functional fire detection and extinguishing system incorporates the continuous loop and spot detectors with corresponding controls, indication, and test circuits. This dual sensor simulator features the two predominant systems in the aerospace industry. The extinguisher discharges shop air upon activation of the system. Systems trainer provides a hands-on resource for troubleshooting faults that can be introduced by the instructor to challenge the student. Typically, the bottle charge is maintained by a breakable seal. We use shop air to discharge from the flexible hose, simulating a bottle discharge. Fenwall spot detector sensor hybrid into the fire detection alarm system. All electrical wires marked with ATA codes corresponding to the electrical schematics provided. Fire extinguisher bottle pressure gauge is wired into the system giving a simulated bottle pressure; full or empty indication dependent upon system condition includes automatic reset.